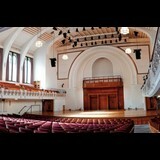 seasonal surroundings of Cadogan Hall. ... ON SALE : MONDAY 17 DECEMBER , 10AM. ... & 2018, G4 return in 2019 with their biggest and best Christmas tour to date!